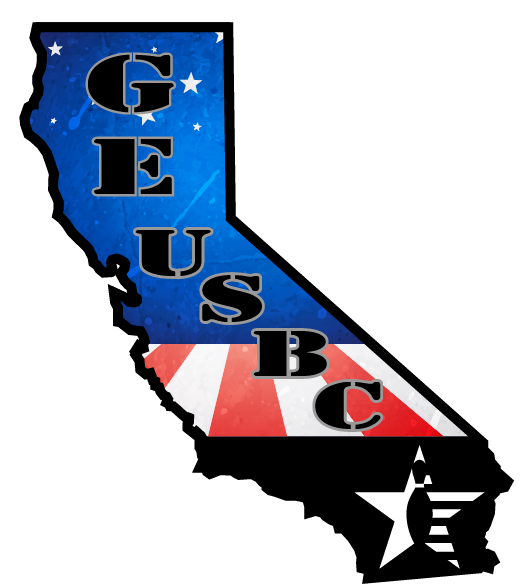 The first tournament put together by the newly-formed Golden Empire USBC Tournament Committee is this weekend! The Bakersfield Scratch Open takes place on Sat., August 11/National Bowling Day and is at AMF Southwest Lanes. There are two qualifying squads—one at 9:30am and the other at 2pm. $1,000 is guaranteed for first place (based on 50 entries). Cost to enter is $80 for 6 games of qualifying. Tournament is open to everyone! Tournament oil pattern is Statue of Liberty. For further information on this event, go to geusbc.org or email Information.geusbc@gmail.com. –Celebrate National Bowling Day at The BLVD! On Saturday, August 11, from 8am-10am, you can bowl at The BLVD! for just $2 a game with just $2 for shoe rental (up to 6 people per lane). So if you’ve been wanting to check out bowling and experience The BLVD!, here’s your time to do it! Offer is valid on Sat., Aug. 11 from 8am to 10am only and is subject to availability. The BLVD! is located at 3200 Buck Owens Blvd. across from Zingo’s Café. Good bowling to all our GEUSBC Youth bowlers who qualified as semi-finalists to compete in this event which was formerly the Youth State Scratch Tournament. This weekend will be the last chance qualifier, which will be on Aug. 11 at 1pm at Rancho Bowl. The Finals will take place on Sun., Aug. 12 at 9am at Rancho Bowl. Any questions, direct them to Andre Eubanks at 323/252-7904 or you can email him at aweubanks@yahoo.com. What an afternoon/night! Local bowlers came out in force to try an array of bowling balls that are just being released this week. Many youth bowlers took advantage of trying some balls out too and were thrilled with the words of advice they received from the guys running this demo—Adam Ishman/EBI District Sales Manager from Las Vegas, Joe Goldstein, Sr. EBI Staffer from San Jose, Mario Ortiz from Visalia, along with local EBI Staffers Zack Newman & Carlie Medina III. Diz Francisco was also helping the local youth to understand the different ball types. The Demo Day was originally scheduled from 3pm-6pm but since there was so much interest from local bowlers, they extended the hours through the first half of Robb’s Ball league that night. Joe Goldstein, Sr. later remarked, “I’ve never seen such enthusiasm from bowlers as we have here today! This is great! Most of the time when we run these, people will come out and try maybe one or two balls and then just start goofing off but not here. Some of these guys started at 3pm and tried balls up until their league started at 6:30!” Adam Ishman even stayed and bowled in Robb’s Ball league rolling a high game of 267 with a 761 series. Robb White/Robb’s Pro Shop is taking orders for any of these balls that were at the Demo Day until next Tuesday (Aug. 14) if you would like to get one before Fall leagues are underway. “We get the order in and get the balls in for customer as soon as possible,” said White. 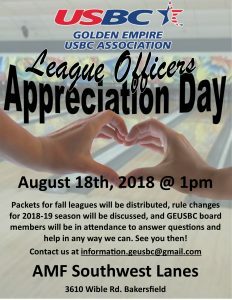 If you are an officer for one of the leagues you bowl in, or know who is, please remind them that the Golden Empire USBC League Officers Appreciation Day/Secretaries Workshop is on Sat., Aug. 18, starting at 1pm at AMF Southwest Lanes in the meeting room down behind lanes 1-10. This is open to Fall league officers so they can come pick up their league packets, meet the officers and directors of the Golden Empire USBC and find out what is new for the 2018-19 bowling season. This is also a good time to bring any questions/concerns you may have with your league to get them answered. If you have any questions about this event, you can contact Nancy Weber, our Assoc. Manager at 661/204-1484 or go to our website geusbc.org or email at geusbc@aol.com or information.geusbc@gmail.com. Hopefully every league will have a league officer attend this function. The annual Kid’s Fest will be taking place from 1pm-5pm on Sat., Aug. 18 at AMF Southwest Lanes (3610 Wible Road). This event gives kids (1) hour of FREE bowling plus FREE shoe rental and a FREE $5 Arcade card! There will also be $1 soft drinks and $2 pizza slices available. You could win this and be the champion of your age division which will then qualify you to the 2019 USBC Senior National Championships! There is an Open division and a Women’s division. Age classifications are as follows: 75-over (Super Senior); 70-74 (A division); 65-69 (B division); 60-64 (C division); 55-59 (D division); and 50-54 (E division). It’s a handicap tournament (90% of 220). Walk-ins & re-entries are welcome; however walk-ins are based on lane availability and no walk-ins accepted ½ hour prior to the start of the squad. Squad times are at 2pm on Thurs., Aug. 16 (if needed); then at either 9am or 2pm Fri.-Sun., Aug. 17-19. Also, note, Walk-Ins must bring their bowl.com average printout in order to enter brackets. Cost to enter is $50 for 6 games. 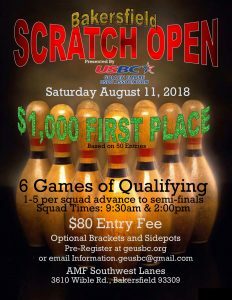 If you would like to pre-register, you can either go to calusbc.com, download application and pay online or you can write a check, payable to CUSBC and mail entry to Mabel Sheasley, Sr. Singles Tourn., 2069 E. Orwood St., Stockton, CA 95205-3223. Any question, contact Mabel at 415/492-8880, ext. 312 or email her at Mabelruth@aol.com. Caught up with a trio of local bowlers—Stephanie Sanders, her daughter Kira, and teammate Steven Fernandez—who traveled to Syracuse, NY, recently to compete in the 2018 USBC Open Championships to get some idea of what it was like to compete in this event. 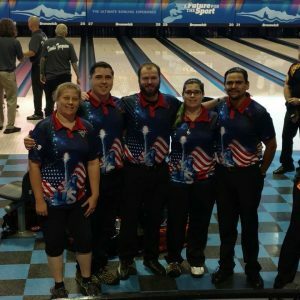 Stephanie had bowled the USBC Nationals in 2017 so she had one under her belt, but it was Kira and Steven’s first time to compete. As far as their personal bowling backgrounds, Stephanie has bowled now for about 30 years, Steven for about 14 years and Kira just about 2 years. Back in March, another teammate, Kevin Hale, decided to put the team together with Brett Barnhill, and a date was selected so the planning could start. They ended up bowling the last weekend which were the last squads available—July 7, 7pm for Team & July 8, 7pm for Doubles/Singles. They also competed in the Bowler’s Journal and 40 Frame Game side tournaments. The traveling excursion was a two-week vacation and they rented a van and drove from Bakersfield to Syracuse. Good thing because Stephanie took (3) balls; Steven took only (2); and Kira took (4)! It took about five days to get to Syracuse with three stops. On the way back they took their time with more stops so they could visit with family, etc. They stayed in New York from July 4 thru July 9th. Their most memorable stops were Mt. Rushmore, Niagara Falls and (4) different Six Flags locations! It was Kira and Stephanie’s first time to visit New York, but Steven had been there before. Asking for their recommendations or words of wisdom to bowlers who might be contemplating competing in the USBC Nationals, Steven said, “I would recommend bowling at different houses as often as possible so you can work on your game in different conditions.” And both Stephanie and Kira said, “Do it. You won’t regret it.” The 2019 USBC Open Nationals will be in Las Vegas, NV! Looking back on their experience, Steven ended saying, “I bowled a little above my average which I’m proud of.” Both Stephanie and Kira are thrilled as they placed in Doubles and Stephanie also placed in All Events! Congratulations and thanks for sharing your experience! Gabriella Mayfield took a much-deserved vaca and closed Mt. Mesa Lanes so she could load up all her bowling equipment and drive to Texas the end of July to take in the tournaments and festivities surrounding the annual Storm PBA/PWBA Striking Against Breast Cancer Mixed Doubles held at Copperfield Bowl in Houston July 27-29. 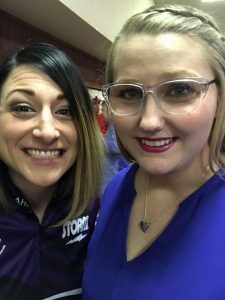 She bowled in the Beauty vs Beast side event which is the top 5 women and top 5 men from last year who qualify for the Baker format and this event was giving out $6k! And, she sponsored this event (in memory of her Grandmother) with event coordinator Donna K. Conners! The main event, Striking Against Breast Cancer Mxd. Doubles drew a field of 79 teams. Gabby teamed up with Steve Pavlinko, Jr. from New Jersey. Champions were the team of EJ Tackett and Liz Johnson. – Gambling Fever – Sunday nights, 6pm, mixed teams, no-tap, league bowls sweepers in Vegas, next season starts on Sun., Aug. 19th! Now thru Mon., Sept. 3rd: Sign up NOW for “Summer Games” Season Pass. Bowl (3) games every day, all summer for (1) low price. Sign up NOW at bowlsummergames.com. Children (15 & Under) Standard Pass is $9.95; Passport is $43.95. For Adults (16 & Over) Standard Pass is $15.95; Passport is $48.95. Pays for itself in (3) visits or less! Mon.-Fri., open at 8pm; Sat. & Sun., open at 4pm. 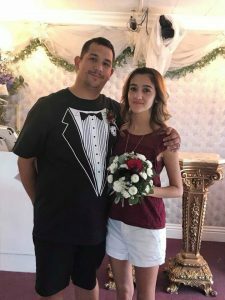 – Congratulations to newly-married couple Andrew Svoren and Carolina Alvarez who tied the knot this past Sunday, August 5th, in Las Vegas!! – Diz Francisco reported that several Golden Empire directors helped with the Special Olympics that competed at AMF Southwest Lanes on Sun., Aug. 5 competing in the 2018 Kern Regional Bowling Competition. Special kudos to GEUSBC Youth Director & Coach Phil Chow, GEUSBC Directors Jessica Allred and Taylor DelTiempo along with CUSBC Youth Committee Director McKenna Powers and local youth bowler Troyance Powers. They volunteered as scorekeepers and/or lane monitors for this event. – Our local youth competed in the 2018 CUSBC Youth State Championships at Keystone Lanes in Norwalk on the weekends of July 21-22 and July 28-29 and posted some pretty awesome scores to place this year. More details in the next column. Don’t have enough room this submission—too much good stuff!! – Congratulations to Craig Dowd, who, subbed on a league on Wed., Jul. 25, at AMF Southwest Lanes while he just stopped by to tune up some of his equipment and put together three great games of 241-268-290 for a nice 799 series! – Congratulations to Stephanie Sanders, bowling in her No-Tap Gambling Fever league, Sun., Jul. 29 at AMF Southwest Lanes, for shooting her highest no-tap series of 855. She had two “almost” no-tap 300 games in the mix putting together games of 287-268-300. Sat., Aug. 11: National Bowling Day at The Blvd., 8am-10am, $2/game and $2/shoe rental (up to 6 bowlers per lane), subject to availability, 3200 Buck Owens Blvd. Handicap Doubles: 1. Billy Weeks & Caleb Miller (1696); 2. Bette Addington & Eric Grider (1677); 3. LaDonna Helton & Alex Garcia (1672). Handicap Singles: 1. Caleb “Pudge” Miller (868); 2. Russ Tweedy (867); 3. LaDonna Helton (848). 3-6-9 pot was not hit again carryover pot is now at $220! Alex would like to thank Ron Andrews, Brit and staff for a nice shot! And, “L.A.” Donna for always being there. Special shout-out to John Curtis and Pudge for your Excel specialties to enhance the new Addington system! Handicap Doubles: 1. LaDonna Helton & Andrew Svoren (1602); 2. Mike Helton & Pudge Miller (1563); 3. Eric Wisdom & Thomas Stancil (1561). Handicap Singles: 1. Andrew Svoren (859); 2. Pudge Miller (843); 3. Norris Richards (816). 3-6-9 carryover is at $170! Thank you to Ron Andrews and his staff for another good slick shot! And thank you, Ron, for the donuts this week! What would I do if I didn’t have Norris and “LA”Donna? We start with the ’18 Book Averages next week. *Coffee Club is on Sunday mornings starting at 11am at AMF Westchester Lanes. Cost to enter is $20 for 4 games, blind doubles draw. Optional high pots, singles, and 3-6-9. Handicapped and fun bowling with some great local bowlers! And, NEW, once a month, a No-Tap Tournament will be scheduled! !